Paul's enthusiasm for painting has always been an essential part of his life. He identifies as artist as well as medical grade footwear practitioner. He has explored numerous styles of art, including oil painting, relief and acrylics. Oil painting has been his predominant style. He has always painted under the pseudonym Paul Galy, which, for simplicity and consistency, he has also adopted as his professional trade name. In 1967, he had his first exhibition of paintings at the Norman Lindsay Art Gallery. 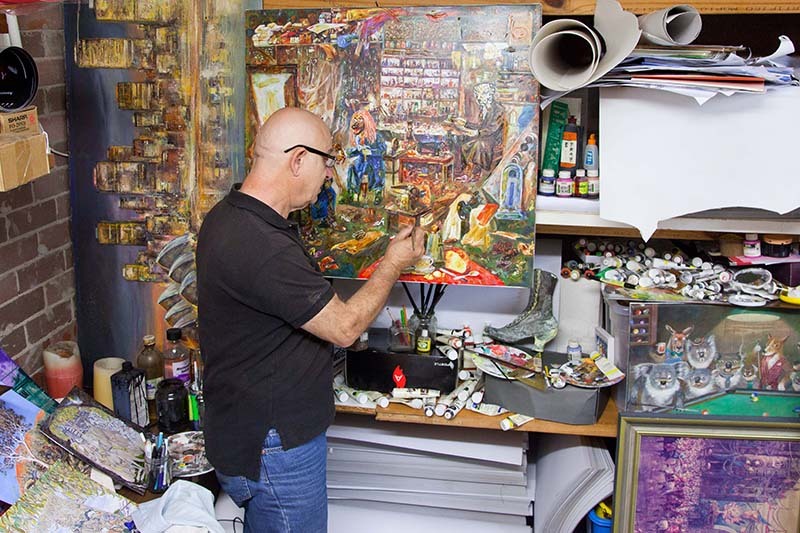 He has subsequently built up an extensive collection of paintings over the years. In 1989, he completed a series of large oil paintings known as The Australian Commemorative Series. The series consists of twelve very large oil paintings, each one 2 metres x 1.25 metres in size, depicting major historical events that portray Sydney’s development, in twenty-year steps from 1788 to 2008. Each painting had been extensively researched and carefully planned to be as historically accurate as possible. The undertaking became a family project. This ambitious project included the development of a book that Paul published in Australia outlining Australia’s history, known as The Australian Commemorative Series: An Australian History Through Sydney’s Eyes. Paul's son researched and wrote the book, each chapter providing a chronological historical account of the twenty-year period in which the historical event is set, and a detailed narrative of the historical event being depicted. Originally known as The Sydney Spectrum, the paintings became The Australian Commemorative Series because Paul planned to complete the series for the 1988 Bicentenary. A serious accident, however, incapacitated Paul which delayed the completion until 1989. The paintings have been exhibited a number of times in Australia, including in Waverley, Randwick, Sydney, Blue Mountains and Yass, between 1989 and 2001. The Limited Edition Australian Commemorative Series Art-History Book and Limited Edition Prints are now available through this website. Mongrel Series, consisting of large oil canvases composed of a anthropomorphic canines, in Leura in 1997. Australia Day Series and Outback Australiana Series, consisting of oil paintings depicting Australia Day Sydney Harbour scenes and outback landscapes with sheep and cattle, in Darling Point in 2000.